The harrowing story we missed from Paradise, CA as Camp Fire rages on. The harrowing story from a hospital we missed during California's deadly wildfires. When Tamara Ferguson arrived at work last Thursday, she saw an “orange glow” outside. Ferguson, a labour and delivery nurse at Adventist Health Feather River Hospital in Paradise, California was told at the time that Camp Fire, one of the state’s raging wildfires, was not “super close”. But within an hour, she was going room to room telling parents to get up, wrap their babies up and get out. Sharing her harrowing story in a Facebook post, Ferguson said there was no time to grab personal belongings – everyone lined up in the ER ready to go. The Camp Fire is one of two wildfires still raging in California – and the deadliest fire in the state’s history. The death toll stands at 76, with many people still missing. As of Sunday, AEST time it had burned through 149,000 acres with 55% containment. Ferguson wrote that the crew planned to take patients from Adventist Health Feather River to the nearby Enloe Medical Center in Chico, about 30 kilometres away, but as they travelled they learned that one of the ambulances was on fire. She said patients included mothers who had just given birth by cesarean, elderly and those in a “critical” condition. 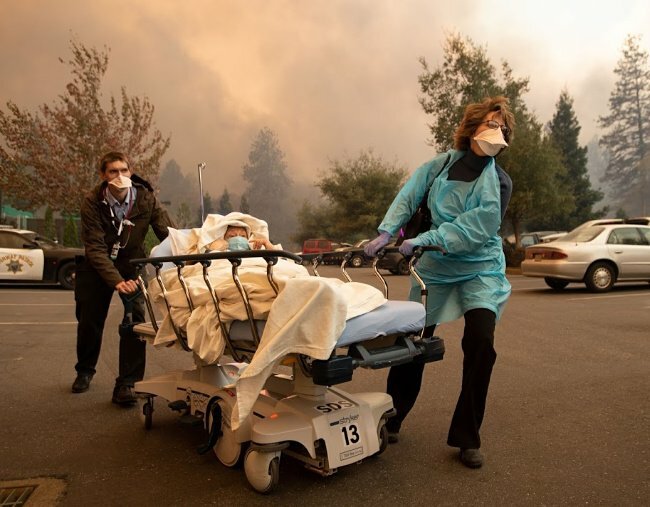 Patients are quickly evacuated from the Feather River Hospital as it burns down during the Camp fire in Paradise, California on November 8, 2018. Image: Getty. "I wanted to run, just get out and run down the street and dodge flames and get to safety... but reality reminded me I am not faster than a fierce, fast blowing fire. Do I stay in the ambulance? Hide in the garage with my patients? I looked around and it just kept surrounding me growing bigger, I saw cars stuck in gridlock trying to leave, fire surrounding both sides of them, I felt so scared, hopeless, and desperate," she wrote. 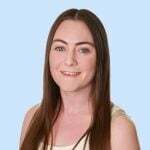 Ferguson wrote that she truly believed she was going to die, but in between desperately calling her loved ones to say her goodbyes, she and another hospital staff member called Chrissy did all they could to clear brush surrounding the house and provide patients with care. "We need to save our patients and ourselves," she wrote. "If we were going to die today we would at least do it protecting others and do everything we can to live and we did!" 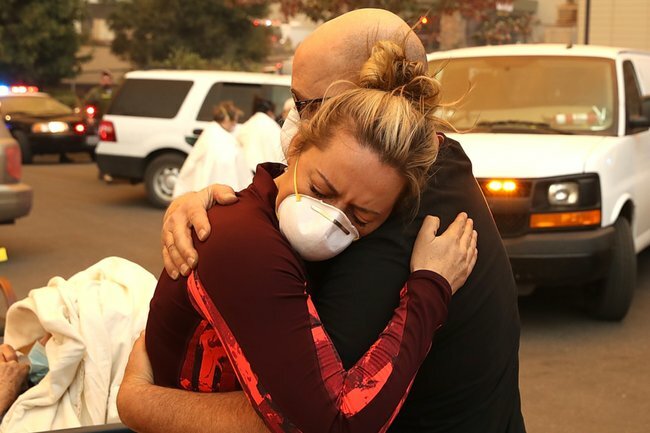 After some time, authorities told Ferguson and hospital staff to get themselves and their patients back to the very hospital they had escaped from instead of towards Chico and away from the fire. They returned and were rushed to load the patients and themselves into waiting sheriff&apos;s vans, police cars and ambulances to be escorted away from the burning hospital once and for all. As they escaped, Ferguson said she looked out the back window of the vehicle she was in. "We watched the flames beside us, burnt cars in the road, power lines down, and fresh homes burning, it went on for miles," she wrote. She could not believe she had made it. "I honestly couldn’t believe I was alive, that I would see my family, kids, and boyfriend again. I called them and told them I made it... They were all crying before I even told them because they couldn’t reach me and thought I was gone." She arrived at Oroville Hospital, about 36kms away, where she helped unload patients and get them inside to safety. Her story is truly harrowing and shows the heroic actions of medical staff and emergency services in the area. As Ferguson wrote: "We were an awesome team of mostly strangers doing whatever we could and HAD to and we did phenomenal." Ferguson concluded her post by saying she would be "forever changed" by that day. "Today and everyday I urge you to live with no regrets, do what makes you happy, make sure your loved ones know how much you love them and how much they mean to you and NEVER take one second for granted."